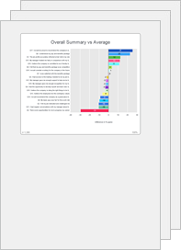 Rating Comparisons compare all rating questions against the average or other selected target or benchmark to highlight differences, in a chart. Helps focus attention on high and low values and areas that might need attention. Useful for action planning. The items are sorted by the chosen Summary Calculation (see Settings).